Many of my articles focus on reversing Hashimoto’s, but as they say, an ounce of prevention is worth a pound of cure. 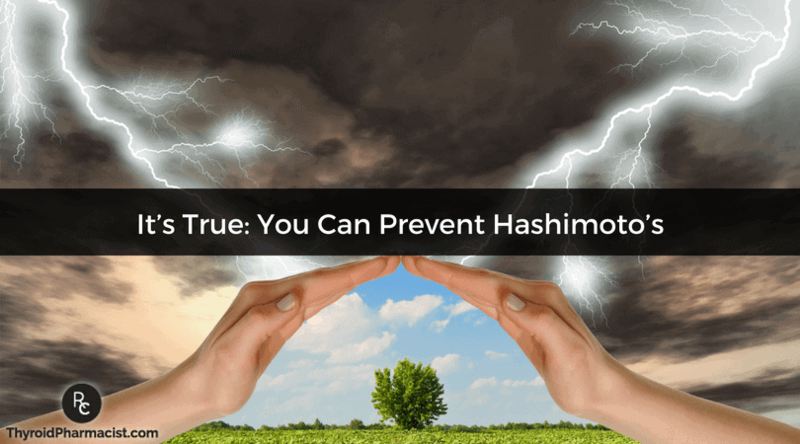 I often get questions from readers about whether it’s possible to prevent Hashimoto’s. We know that autoimmune disease tends to run in families, and people commonly assume that genes are to blame. This is only partially true—genes are not our destiny! The million-dollar question is: Can you prevent Hashimoto’s? Yes, you can! Read on, and I’ll tell you how! Hashimoto’s is an autoimmune thyroid condition that results in hypothyroidism due to the destruction of the thyroid gland by the immune system. Symptoms of Hashimoto’s may include those associated with hyper and hypothyroidism, like fatigue, anxiety, depression, weight gain, weight loss, cold/heat intolerance, and pain. Testing for Hashimoto’s should include thyroid antibody tests and a thyroid ultrasound. See below in this post for more information on testing. Hashimoto’s is a progressive condition, and 5-stages of Hashimoto’s have been identified. During the first stage, a person just has the genetic predisposition to develop Hashimoto’s, but for all intents and purposes, they do not have thyroid disease or autoimmune disease. Their thyroid function is normal, and there is no attack on the thyroid. In the second stage, the immune system begins to recognize the thyroid gland as a foreign invader, and immune cells become lodged in the thyroid gland. At this stage, a person will have symptoms, but their TSH, T3, and T4 will be normal. However, thyroid antibody tests may reveal that the person has thyroid antibodies. If left untreated, this condition often progresses, especially if a person has a high number of thyroid antibodies. There is also a variant of Hashimoto’s known as seronegative Hashimoto’s, where no antibodies are present, but a person will still have immune cells in the thyroid gland. These can be measured through more invasive testing like cytology, where a needle is inserted into the thyroid gland and thyroid cells are withdrawn, then evaluated under the microscope. The third progressive stage occurs when the thyroid loses its ability to compensate, and thyroid hormone production starts to become affected. This stage will show a mildly elevated TSH (between 2-10), while the T4 and T3 levels will remain “normal.” This is often described as subclinical hypothyroidism. Also, TSH may fluctuate because the thyroid is still somewhat able to compensate. More symptoms are usually present at this stage. However, some doctors refuse to prescribe medications. Many patients are told to come back when their thyroid begins to burn out. Read more about this in my post: What To Do If Your Tsh Is Normal And You Are Anything But. The fourth stage is defined as thyroid gland failure, where the thyroid gland loses its ability to make thyroid hormones. Too much of it has been destroyed, TSH will be elevated, T4 and T3 will be low, and you will finally be “diagnosable” and “treatable.” At this point, most conventional doctors are willing to prescribe medications. However, I would argue that people as early as stage 2 can benefit from medications, which allow the thyroid gland to rest and slow down internal inflammation by reducing thyroid hormone production. Conventional medicine states that if you start thyroid hormones, you will never be able to get off them. I disagree. Reports have shown that thyroid function spontaneously returned in 20% of patients with Hashimoto’s. Thyroid function will remain normal in these patients, even after thyroid hormone replacement is withdrawn. Studies also show that once the autoimmune attack is stopped, the damaged thyroid has the ability to regenerate. The fifth stage of Hashimoto’s, which is unknown to many, is the progression to other autoimmune diseases, such as Sjögren’s, lupus, and many others. Some doctors offer to test their patients annually for additional autoimmune disorders for this reason. Because Hashimoto’s is progressive, things can go from bad to worse if you don’t make a concerted effort to improve them. This is because our environment impacts our disease expression and disease progression. Various triggers, ever present in our environment, can accelerate the movement between the stages, while lifestyle and functional medicine interventions can slow down the movement between the stages and even help a person move backward, reversing the condition. But the environment is far more important than genes. Research leads me to believe that most of us actually have the genetic predisposition to develop autoimmune thyroid disease and when presented with a strong enough trigger, or multiple simultaneous triggers that overwhelm the body’s natural defenses, an autoimmune thyroid condition is inevitable. For example, A 1997 study of children who were between age 0 and 7 at the time of the Chernobyl nuclear fallout and lived close to the Chernobyl nuclear reactor showed that 80% of them had thyroid antibodies, compared to 17% of genetically similar children who were farther away from the Chernobyl site. Study after study is showing that rates of Hashimoto’s are going up with each passing year. The likely culprit? Environmental toxicity in our air, water, and food that weakens our internal resilience. In my research and work with Hashimoto’s patients, I’ve found that Hashimoto’s is caused by a combination of nutrient depletions, food sensitivities, an impaired stress response, and impaired ability to handle toxins as well as chronic low-grade infections. Intestinal permeability is also present. 1. Get to the bottom of your gut problems. We know that intestinal permeability (aka leaky gut) is present in every case of autoimmunity and often precedes the development of Hashimoto’s. Symptoms of leaky gut may include bloating, diarrhea, constipation, stomach aches, acid reflux and irritable bowel syndrome. According to the Institute of Functional Medicine, many people develop IBS 5-10 years before an autoimmune diagnosis. I was one of them and didn’t take my gut health as seriously as I should have. Your poops should be well-formed, easy to pass, and should occur with a frequency of once or twice per day. If you’re pooping once a week, we have a problem! If you have a hard time passing stools or have hemorrhoids, this is also a problem. Check out the Bristol Stool Scale. You should be at a 3 or 4 on most days. If you’re not, we need to figure out why. Gut problems are often caused by infections like H. pylori, parasites like Blasto, SIBO, an imbalance of bacteria, and enzyme deficiencies or food sensitivities (especially to gluten, dairy, and/or soy). Even stress can be a factor in gut permeability. Sometimes it’s a combination of all of the above. I recommend doing a 3-4-day stool collection to determine if you have an infection in the gut and follow the suggestions below for more information. 2. Figure out your Food sensitivities. Food sensitivities create intestinal permeability and rob us of nutrients required by our thyroid and immune system. Furthermore, there’s evidence that the same types of antibodies to various reactive foods may also perpetuate or cross-react with thyroid antibodies! Up to 20% of people with celiac disease can completely reverse Hashimoto’s when they switch to a gluten-free diet. Additionally, in a recent survey of 2,232 of my readers, 86% of people who went gluten-free reported an improvement in digestive symptoms. I personally had a celiac-like reaction to dairy, likely for most of my life. It wasn’t until I cut out dairy from my diet that I realized that it wasn’t normal to have stomach aches every day. One of the challenges with food sensitivities is, when we eat the foods that our body is sensitive to regularly, it can be difficult to connect the foods with the symptoms we are having. As a starting point, I recommend a lifestyle that is gluten-free, dairy-free, soy-free, low in processed foods, and nutrient dense to heal and prevent disease. In some cases, further dietary protocols, like the Elimination Diet, can help to uncover additional problematic foods, and may need to be utilized to heal the gut… For more information read: Which Thyroid Diet Is Right For Me? 3. Soak up the Sun (and supplement with vitamin D!). Autoimmune disease seems to be more prevalent the further away we are from the equator. Vitamin D deficiency may be to blame, as this important vitamin, required for proper immune system, gut, and thyroid function, is primarily absorbed through our sunscreen-free skin on sunny days. I recommend getting lots of sunshine as a preventative measure. I also recommend vitamin D supplements for most people. Vitamin D levels should be between 60-80 ng/ml for optimal thyroid receptor and immune system function. Vitamin D has been shown to prevent autoimmune disease in clinical trials and may help us properly fight infections like the Epstein-Barr virus. As I’ve written in my article on Epstein-Barr, 80% of people with Hashimoto’s have the Epstein-Barr virus in their thyroid glands, as do 62.5% of those with Graves disease. The virus can be a trigger or an exacerbating factor for many with autoimmune disease. While 90% of people have this virus, those who contract the virus as teens or adults (in contrast to during childhood), are more likely to be debilitated by the virus. This is because our body uses vitamin D-dependent immune cells known as CD8+ T to suppress the Epstein-Barr virus. CD8+ T cells decrease with age, are lower in women, and are further reduced when vitamin D intake is low. Thus, keeping vitamin D levels at an optimal range can help us fight and suppress the virus. Keeping the virus suppressed can not just prevent Hashimoto’s, but can also be the key to getting an active case of Hashimoto’s into remission. I have other strategies for EBV suppression in my post and am currently testing and researching ways to remove/eradicate the virus from the body. Be sure to subscribe to my newsletter if you’d like me to keep you posted. 4. Pack those probiotics. A common story I hear is that a person will be traveling and will have about of “traveler’s diarrhea”, or food poisoning before their health begins to decline. From a functional medicine perspective this makes a lot of sense to me – the person’s gut barrier had become compromised by a pathogen and the pathogen remains in the gut creating a chronic low grade infection that leads to intestinal permeability, and eventually leads to the manifestation of autoimmune disease. I recommend S. boulardii from Pure Encapsulations or Protocol for Life Balance for the prevention of traveler’s diarrhea, as it boosts our body’s secretory IgA. This acts as a natural defense, preventing us from getting pathogens. I prefer the Pure Encapsulations brand of S. boulardii (it seems to be more potent), but it does have to be refrigerated. When I’m traveling, I use the Protocol for Life Balance brand or the over-the-counter Florastor. Florastor has a kids’ version too (please note: it contains a small amount of lactose, which is tolerated in most cases, however if you are ultra-lactose intolerant, you may want to go with one of the two other brands!). 5. Supplement with selenium. Selenium deficiency has been recognized as a risk factor for autoimmune thyroid disease, including Hashimoto’s, Graves and postpartum thyroiditis. Doses of 200 mcg were used as a preventative and as a way to reduce thyroid antibodies in those who already had them. Many people may try to get their selenium from brazil nuts, rather than supplementing. While I love the idea of Food Pharmacology and getting our nutrients from food, the amount of selenium in Brazil nuts has been found to vary greatly, depending on where the nut was grown. So, I recommend taking a selenium supplement instead, like Pure Encapsulations selenomethionine, to get a consistent dose. Please check with your doctor or pharmacist for dosing in children. You can read more about selenium in this post. 6. Easy on the iodine. Numerous studies have shown that iodine, when used in excess (especially when selenium is deficient), can trigger and/or exacerbate Hashimoto’s. I recommend doing an evaluation of your daily iodine intake and keeping it to less than 500 mcg per day (The recommended daily allowance is 150 mcg for adults, 220 mcg for pregnant women and 290 mcg for breastfeeding women. Children’s doses are based on age, and can be viewed here). The amount of iodine that is present in multivitamins is usually not an issue for most people with Hashimoto’s, especially when combined with a high quality selenium supplement. I like the Thorne Prenatal and the Pure Encapsulations’ Nutrient 950 multivitamin for good sources of iodine and other nutrients. However, be wary of using high dose iodine supplements, spirulina, kelp or seaweed snacks. I have a few clients who traced the onset of Hashimoto’s to high dose iodine consumption. Furthermore, some clients have reported that iodine has exacerbated their Hashimoto’s, causing an acceleration of thyroid tissue damage, increased thyroid antibodies and making them feel worse. Please note, for some people (especially those with fibrocystic breasts), iodine may be helpful in their journey to health and wellness, but if you have Hashimoto’s (or are at risk for it), I would recommend proceeding with caution. Overall, my survey of 2,232 people with Hashimoto’s found that 28% of people felt better, but 30% felt worse using high doses of iodine. Please remember that iodine does not live by itself in a vacuum. If you’re considering taking iodine beyond the dose that’s present in multivitamins and prenatals, I recommend working with a knowledgeable practitioner who will test your thyroid antibodies before and after starting to ensure that you are not having an adverse reaction. 7. Skip the soy and don’t formula feed your babies with soy-based formulas! There are only a few studies that connect soy to thyroid disease, and one of them found that babies fed soy formulas had higher rates of thyroid antibodies later in life compared to breastfed babies. Soy has also been reported to block thyroid peroxidase and can inhibit T4 to T3 conversion. My clients and readers have reported an increase in palpitations, nervousness and thyroid antibodies after consuming soy. I recommend skipping tofu, miso and soybeans to support your thyroid. Better yet, cut out all processed foods as soy is often a hidden ingredient in these products! 8. Manage your magnesium. Magnesium is needed for iodine utilization by the thyroid gland, and conditions like Type 2 Diabetes, Crohn’s disease, and hypothyroidism, as well as stress and certain medications can all put us at a greater risk for depletions in magnesium. In my experience, joint pain, leg cramps, menstrual cramps and thyroid disorders are all reasons to suspect magnesium deficiency. Also, researchers have found that supplementing with magnesium citrate can help to lower an elevated TSH. You can read more about magnesium in my post magnesium and the thyroid here. 9. Vet your vaccines. While I certainly believe vaccines are a lifesaving intervention that has helped the masses, the truth is, any foreign invader in the body can produce an immune response, and sometimes the immune response could be autoimmune in nature! A recent study, sponsored by Merck, found that the Gardasil vaccine for HPV (Human Papilloma Virus) has been associated with higher levels of Hashimoto’s in young women, though the researchers concluded that “based on a lack of temporal clustering and biological plausibility of a relationship, there was no consistent evidence for a safety signal for autoimmune thyroid conditions”. I believe the relationship is plausible, via the molecular mimicry mechanism: when the immune system creates a reaction to a vaccine, it may also attack any other “similar” looking structure. You can review the HPV study and judge for yourself. While most doctors will tell you that all vaccines are absolutely safe, in past years, other vaccines were taken off the market due to reports of autoimmune reactions, and independent case reports have tied HPV to other autoimmune conditions. As a pharmacist, I am well aware that all medications can have various adverse reactions, especially in those who are genetically susceptible, however there is a lack of independent studies (not funded by manufacturers or public health organizations) measuring adverse reactions to vaccines. I personally I believe that educating our sons and daughters about sexuality, safety, and self-worth can hold the key to lowering rates of the sexually transmitted viruses. 10. Smarten up about stress. Looking over the health histories of thousands of people with Hashimoto’s, I‘ve found that an inability to manage stress is often at the core of the condition. Most people can trace back the development of Hashimoto’s and autoimmune conditions to a particularly stressful time period. Stress is inherent, and it’s how we handle our stress that matters. I recommend self-management stress-reducing habits like mindfulness, yoga, and meditation. Meditation has specifically been found to be helpful in building resilience to stress. If you have ever tried meditation and failed, I have some good news! Meditation teacher, Emily Fletcher, is offering online meditation training that will give you powerful stress relieving tools from the comfort of your home. If you have a history of childhood trauma like I do, your stress response could be severely impacted, leading you to overreact and get into a ‘fight or flight’ state at the easiest provocations. I recommend therapies like the self-guided tapping, self-help books, neurofeedback or therapist guided EMDR to reset your stress response. 11. Green your routine. People who live closer to petrochemical plants are more likely to suffer from thyroid disease. What we don’t realize is that often times our homes can be full of toxic chemicals as well! Studies have found people living in fluoridated communities are more likely to have thyroid disorders. The higher the levels of fluoride, the higher the number of thyroid disorders. BPA in plastics has been connected to hormonal disturbances, as has triclosan in antibacterial soaps and toothpastes! Chemicals in mattress covers can also contribute to thyroid autoimmunity. Don’t even get me started on conventional beauty products! I recommend greening your water with a fluoride filter, buying a cover free mattress and cleaning up your makeup and personal care products. 12. Speak your soul. I don’t think it’s a coincidence that women are 5-8 times more likely to suffer a thyroid condition. Hormones and personal care products contribute for sure, but other factors in our society, such as the forced suppression of self-expression for women can be a part of the perfect storm by creating an impaired stress response. I remember seeing a quote “Speak your voice ladies, the only person you will scare off is your future ex-husband”. I wish I had heard this quote in my younger years. Because somewhere along the lines, I, like many women, learned to censor and edit myself to be more appealing to others, leading me to harbor inflammatory emotions like resentment and self-doubt. If you are finding that you too have been socialized to be a wallflower, nice, polite, a victim, martyr or judge, I recommend that you consider this behavior pattern as big of a risk factor as Gluten or infections are for autoimmune thyroid disease. I believe the book Warrior Goddess Training should be required reading for all women who want to connect with their true selves. It’s the equivalent of 10 years of therapy, self-seminars and personal growth wrapped up in one elegant little book. 13. Sweating and sauna therapy. We know that toxins are implicated in autoimmune thyroid disease. One great way to get rid of toxins is to sweat it out. I recommend an infrared sauna like the Sunlighten, hot yoga, and Epsom Salt baths. 14. Consider an annual cleanse. Annual check-ups are recommended for people at risk for thyroid disease, and they sure can be helpful to catch thyroid illness early, but wouldn’t it be better if every year, you did something that reduced your chance of diagnosis instead? Since we know that toxins are an issue, doing an annual cleanse for the healthy person (like Rootcology’s Liver Reset), can prevent the buildup of toxins, which lead to a breakdown of self-tolerance. A parasite cleanse may help with getting rid of intestinal toxins that are causing gut inflammation, as well. 15. Get a gander at your genes. I like 23andme, and running it through a service like NutraHacker, LiveWello or Genetic Genie, to interpret your genes can help with predicting some of your risk factors. Some individuals with Hashimoto’s may have a gene variation that prevents them from properly activating folic acid. If your genes reveal that you are a “poor methylator,” you may benefit from supporting your methylation pathways. See my post on MTHFR for more information. 16. Be mindful of mercury. Mercury toxicity can lead to autoimmune thyroid disease. Be wary of dental amalgams – the mercury from them can build up in thyroid tissue, so avoid them if possible. If you do have them, removing them can help reduce thyroid antibodies if you are sensitive to mercury. Your dentist can also run the MELISA test to see if you are, in fact, sensitive. Please be sure to work with a holistic dentist to get them removed, because for some people, removing mercury amalgams can be worse than keeping them. 17. Consider postpartum placenta pills. If you become pregnant, you may want to think about encapsulating your placenta. I know that this may sound unappealing, and some of you probably threw up a little in your mouth reading this, but humans are the only mammals that do not consume their placentas. The placenta is full of nutrients, and proponents say that “placenta pills” can prevent postpartum anemia and postpartum depression, which are two conditions tied intimately to Hashimoto’s and may trigger thyroid disease. I hope these tools help you and your family live your best life by making sure your body has the best environment to thrive! Please share this post with your loved ones to help them prevent future health challenges! Have you found that Hashimoto’s runs in your family? Thank you for all your helpful, informative information. I have Hashimotos, Sjogrens and MTHGR and the past year have been working with a holistic nutritionist and her views are very similar to yours, as she highly recommended you to mè. Thank you again. I love this article extrmely helpful!! My daughter was diagnosied at 10 with hashimoto and 2 years later her endro has not prescribed medication becasue her thryroid is producing hormones. I am completely lost I have no idea what to do.. I have been giving her selenuim, magnesuim, porbiotics and b complex and vitamin D.
Juliette – thank you for following this page. My heart goes out to you and your daughter. <3 For children, teens, (and adults), I always recommend starting with the diet. Are they gluten, dairy, corn and soy free? Are they eating a nutrient dense diet with fermented foods? So glad I stumbled across this page… I believe I am in stage 2 but progressing. I tested positive for thyroid antibodies about two months ago. I am a collegiate runner and training has been very difficult lately due to the intense fatigue I’m feeling. I was wondering what you know about intense physical activity and hashimotos and how to balance the two. I have been taking synthroid for about a month now but only a small dosage. I felt a small improvement at first but I have days where I just feel absolutely miserable. This is a very frustrating time for me and I’m just hoping to find some answers… thank you!! David – thank you for following this page. When you have been prescribed thyroid replacement hormone but your thyroid levels are still not optimal and your doctor is convinced that Synthroid® (which is a T4 only hormone replacement) is the only replacement that you should try, remember, information is power! In order to self-advocate, it’s important to understand the ins and outs of thyroid medications. There are many reasons why your thyroid levels might not be optimal and my Optimizing Thyroid Medications eBook will give you those answers as well as give you a full explanation of the different options that are available to you! I want you to be empowered, so I’m giving this eBook away as a FREE download this week! Download it for FREE Optimizing Thyroid Medications eBook! I have Hashimoto, PCOS and Fibromyalgia, my question is regarding VPH vaccine, I had mine about 10 years ago and I wonder if since I had it, will I be able to get my Hashimoto on remision following the protocol or am I doomed? Juliana – thank you for following this page. Unfortunately I cannot give you any straightforward guidance about vaccinations and we each have to make our own informed decision about this. As a pharmacist, I certainly think that vaccines can save lives. I can also tell you that there’s no drug on the market that doesn’t have any side effects. It’s quite plausible that a vaccine, which introduces a foreign invader and an infection, even though it’s a deactivated infection, could set off the immune system in the person with the right genetic predispositions and perhaps some other things going on within their body that can trigger autoimmune disease through a mechanism known as molecular mimicry. There have been some studies suggesting that there was a connection between vaccines and other types of autoimmune condition in older times and some of these vaccines were removed off the market. There was one study done by Kaiser Permanente regarding the HPV vaccine, which looked at different types of signals that might suggest that a person may develop an autoimmune condition after the vaccine. They actually did see higher rates of Hashimoto’s with the HPV vaccine statistically. While I only work with patients with Hashimoto’s, oftentimes patients will have additional autoimmune conditions. Most autoimmune conditions have common root causes, and a lot of times the things that are recommended for one autoimmune condition will help with others. Conditions that I have found to respond really well to the Hashimoto’s protocols have been rheumatoid arthritis, lupus, Celiac disease, irritable bowel syndrome, eczema, asthma, Graves’, premature ovarian failure, psoriasis, Alopecia Areata, and Sjogrens. I have also seen the protocols help with Fibromyalgia, chronic fatigue syndrome, PCOS, as well as Type 2 diabetes, Crohn’s, and Ulcerative colitis. Hi DR. Wentz. I’ve been diagnosed with Hasimoto in December 2005 after the birth of my only child. I was very sick and the levothyroxine helped me get back on track. I was also diagnose with bipolar eleven years ago when I abruptly stopped my thyriod medication. I get big bursts of energy and able to do loads of things think fast. and then other days I feel completely burnt out. I’m going on a blood test next month and have to go back to my doctor in November. He is testing me for thyroid antibodies. so I hope I have good results. Most stressors have been removed from my life at this stage so I hope I can recover as time goes by. I borrowed your book (root cause) from the public library in Dublin where I live. Which of the Sunlighten saunas do you recommend? Do you use full spectrum or just far infrared? Taylor – thank you for reaching out. I recommend an infrared sauna like the Sunlighten. I would like to start using essential oils. 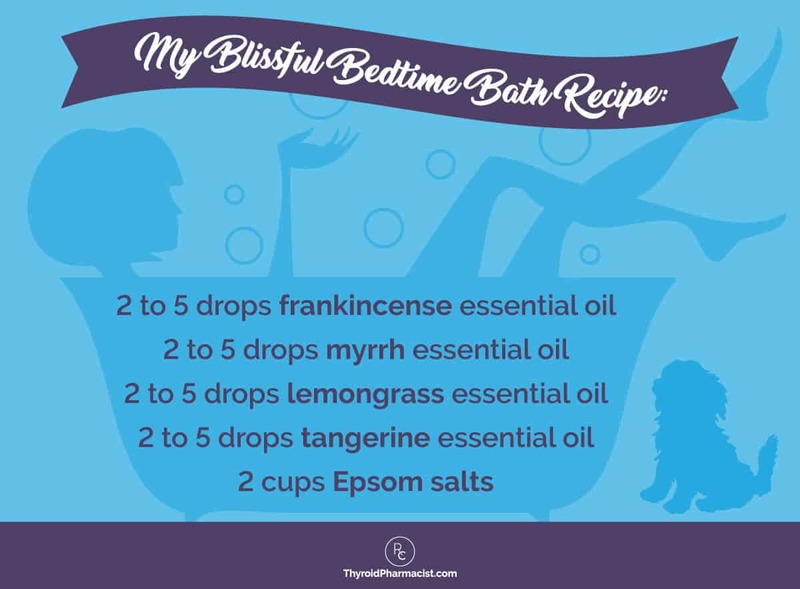 However, I have also read that people with autoimmune diseases should be careful using essential oils, since these stimulate your immune system which is causing the problem in the first place. What are your thoughts on essential oils and autoimmune disease / hashimotos and are there specific essential oils to avoid in this case? Corlene – thank you for reaching out. In one of my articles I refer to Carrie Vitt who uses essential oils to balance the thyroid. You may be interested in checking out this article. I just can’t thank you enough for all you do and have done for those of us navigating this territory of Hashimoto’s and it’s root causes! I feel so much more validated and supported each time I read your articles and continue to find out more and more that makes me realize how much longer this was going on inside me than I ever knew! Thank you thank you for empowering and supporting us! And, if I could be so fortunate to have a healthcare person on my team in person such as yourself wow! Happy New Year! Anna – thank you for your kind words and support! <3 I hope you have a Happy Healthy New Year! I believe that everyone needs to find a practitioner that will let you be a part of the healthcare team. You want someone that can guide you, that will also listen to you and your concerns. You want someone that’s open to thinking outside of the box and who understands that you may not fit in with the standard of care. That is why I highly recommend a functional medicine clinician to be a part of your own health care team. It’s an entire medical specialty dedicated to finding and treating underlying root causes and prevent serious chronic disease rather than treating individual disease symptoms. Thank you Isabella for the wonderful article. You mentioned that if someone was in stage 2 and all thyroid numbers were within optimal range, one could still benefit from thyroid medications. Can you please explain/clarify. Francie – thank you for following this page. Here is an article that you might find helpful. Both my son and daughter had a soy formula (Prosobee) when they were babies…..if I’d only known. I also breastfed them. Are there long term effects? They are now in their 20’s? Is there something we can do to “detox”? I myself have Hashimoto’s and I so appreciate all the great advice and help you have provided. Thank you so much. Vee – thank you for following this page. We know that intestinal permeability (aka leaky gut) is present in every case of autoimmunity and often precedes the development of Hashimoto’s. Symptoms of leaky gut may include bloating, diarrhea, constipation, stomach aches, acid reflux and irritable bowel syndrome. According to the Institute of Functional Medicine, many people develop IBS 5-10 years before an autoimmune diagnosis. I was one of them and didn’t take my gut health as seriously as I should have. Gut problems are often caused by infections like H. pylori, parasites like Blasto, SIBO, an imbalance of bacteria, and enzyme deficiencies or food sensitivities (especially to gluten, dairy, and/or soy). Even stress can be a factor in gut permeability. Here is an article you might find interesting. I like get dome kind heslth insurance who pay for alot of this testing and etc! I’m under active thyroid! But last endo i seen just told he agreed i have hashimoto’s! I want to lose weight znd feel better and not be depressed all time! Could tell me what insurance to get whst dr go to around Terre Haute IN! I need a new Dr who takex me serious help get better! Denise – thank you for following this page. I highly recommend that you work with a functional medicine clinician to be a part of your own health care team. It’s an entire medical specialty dedicated to finding and treating underlying root causes and prevent serious chronic disease rather than treating individual disease symptoms. Here are some links that might help! Conventional medicine states that if you start thyroid hormones, you will never be able to get off them. I disagree. Reports have shown that thyroid function spontaneously returned in 20% of patients with Hashimoto’s. Thyroid function will remain normal in these patients, even after thyroid hormone replacement is withdrawn. Studies also show that once the autoimmune attack is stopped, the damaged thyroid has the ability to regenerate. That somehow doesn’t convince me to start thyroid medication, and then think I can successfully get off of it. Twenty percent means 80 percent of the people could not get off medications! The only impressive number I have seen is the laser light study that showed 48% of the people got off their medications, and that still means half the people could not! Now if it was 80% of people getting off medication, now we’re talkin’ ! I have a family member recently diagnosed with Hashimoto’s. I would like to ask if you would recommend a Thyroid specialist that specializes in Hashimoto’s and is knowledgeable about functional medicine? We live in Kentucky. Also, what testing should we request? Thank you! JL – thank you for reaching out for your friend! I highly recommend that you work with a functional medicine clinician to be a part of your own health care team. It’s an entire medical specialty dedicated to finding and treating underlying root causes and prevent serious chronic disease rather than treating individual disease symptoms. What are your thoughts on hashimotos and the Essure (permanent birth control). Can this be part of the cause for my Hashimotos? Mh – thank you for following this page. Here are a couple article you might find helpful. Thank you, thank you, thank you for the extensive education and experience that you offer through your book and articles… a tremendous and pivotal support for me as I have been healing from a Hashimoto’s diagnosis in August. I am working with a functional medicine practitioner and have a nutrition therapy certification, and I still get totally confused, afraid, and unsure as to the root cause, my progress, etc. So, HUGE thank you! I have made a big strides, but am not quite there. Thank you so much for this article. It is exactly what I needed to read. I’m a third year college student. Up until the beginning of my third year I unknowingly lived in buildings with toxic mold, which took me from very healthy to a point of not knowing if I would make it. One of the scariest things from that time was my labs showing euthyroid sick syndrome and even the potential beginnings of Hashimoto’s (low free T3, TPO Ab 8 IU/mL). Combined with the knowledge of how mold can induce AI and other serious damage, this was the wake up call I needed to pay very careful attention to diet (going to AIP from previously being a looser Primal eater) and start supplementing (something I had been philosophically against before). It was very reassuring for me to realize that I’ve done most of the steps here except the testing ones (I have the MCAT coming up in April and launching into specific protocols for those issues if they are existent would be overly stressful). I began studying Midwifery part time in 2014, when my 5th baby was 3 years old – however my health declined and I was diagnosed with Hashimotos 12 months into my study. At this point I was already very unwell and decided to defer my studies and focus on my health, and your book and emails have been an important part of this journey for me. So now I have recommenced my studies – I am feeling a lot better, as I take desicated thyroid supplements- I now take 90mg/day , have eliminated gluten from my diet completely and have learned a lot about reducing the stresses in my life. However my TSH and antibodies continue to increase… but I really do feel so much better and studying is stimulating and also gives me a sense of optimism about the future. So far I have picked out all the units I can do online and which dont involve attending placement because I still wasnt ready to get into the guts of the degree- but now my youngest is 6 and I feel really excited about entering a new chapter of my life as a midwife as this is something I have wanted for many years. BUT – a full course of vaccinations are required to attend placement in hospitals and a recent email informing that all midwifery students (and I suppose working midwives) are required to have an annual flu shot. My gut instinct is that this could be catastrophic for my health. I am tempted to just put my blinkers on and do it anyway, but it really would be tragic for me and my family if I fell apart because of this choice. Then I think maybe I am being over dramatic – I do experience anxiety and it can be hard to trust my instinct – from reading I have done it seems there isnt any clear evidence to say that vaccination with exasperate autoimmune disease, but from my understanding I think it could send my already deranged immune system spiralling into unknown territory. What do you think? Amelia – thank you for reaching out. As a pharmacist, I am well aware that medications can have various adverse reactions, especially in those who are genetically susceptible. While vaccines have saved countless lives, there’s a possibility that some people may have horrible reactions to them. Unfortunately, I am not aware of any tests that would help us predict who would have this type of response. Right before taking the vaccine, I was away on an intense 2-week business trip during which I noticed deterioration of my hives symptoms. After taking the first dose of HPV vaccine, I realized the symptoms got worse – red bumps (not itchy though) develop clearly more easily than before, even when I change clothes or after shower. Tina – thank you for reaching out and sharing your journey! As a pharmacist, I am well aware that medications can have various adverse reactions, especially in those who are genetically susceptible. While vaccines have saved countless lives, there’s a possibility that some people may have horrible reactions to them. Unfortunately, I am not aware of any tests that would help us predict who would have this type of response. I just stumbled across your site and it is full of useful information! I was diagnosed with Type 1 diabetes at 32 (4 years ago) and since diagnosis I have also had high thyroglobulin antibodies but my TPO antibodies are normal. My TSH/Free T3/Free T4 are all normal and I have no symptoms. Some doctors have said I have Hashimoto’s based on my antibodies and some say I don’t, could you please clarify? Is there a reason I’d have high thyroglobulin but normal TPO? Linda – thank you for reaching out. Some people with Hashimoto’s test negative for thyroid antibodies because their overall immune health is so weak they do not produce enough antibodies. I’ve tested negative for antibodies several times. Now I’ve insisted on a thyroid ultrasound. Given that Hashimoto’s is one of the leading causes of hypothyroidism worldwide, I wouldn’t stop until I know one way or another. In Hashimoto’s, the antibodies are found to thyroglobulin (in 80%) and thyroid peroxidase (TPO) enzyme (in 95% of people) Hashimoto’s results in hypothyroidism and is usually treated with Synthroid and replacement hormone. I have Hashimotos, my Mum was diagnosed at 68 yo and I was diagnosed 12 months ago at 43 yo. I’m doing really well on a GF low carb diet, have lost 15kgs and thyroid antibodies decreased hugely. They did go back up when I started low carb probably due to increased dairy intake so I’m just waiting to redo bloods to see impact of going off dairy. Kate – thank you for reaching out and sharing. For children, teens, (and adults), I always recommend starting with the diet. Are they gluten, dairy, corn and soy free? Are they eating a nutrient dense diet with fermented foods? Most of the interventions recommended in my book can be done with children, with the exception of the dosing of supplements. I do suggest that you work with a functional medicine doctor that is familiar with working with children (I only works with adults). I hope this helps! Joann – thank you for reaching out and sharing your journey. I understand how frustrating this can be. There are quite a few options for thyroid medications. In my experience, what works for one person may not work for another. If your doctor will not prescribe the medication which you are looking for, ask your local pharmacist for doctors in your area who prescribe the medication you are looking to try. Have you read these articles?